Now the tradition of having Christmas inflatables on lawns is a relatively recent phenomenon but they are nevertheless popular enough for onlookers to spot them. Of course, some people tend to go all out on them as well. So like them or hate them, they are here to stay. Nevertheless, I don’t participate in this tradition but many do so here’s a post on them. And believe me, there are many you can choose from according to the online listings. Yet, while I can go on and on about all the wonderful inflatable decorations out there, you might find it boring so I’ll put up the ones that don’t seem that glamorous but deserve extra attention for sheer tackiness. Not to mention, there are some inflatables that for some reason seem to make absolutely no sense whatsoever. So without further adieu, enjoy these blow up lighting lawn ornaments that might have some disturbing implications. As most of us have seen A Christmas Story, we all know that Ralphie’s dad received a leg lamp after winning a sweepstakes contest. Still, despite A Christmas Story being a family film, this leg lamp is certainly an R-rated decoration. 2Santa Claus likes to ride on his motorcycle with his reindeer in the sidecar. Wait a minute, isn’t Santa supposed to be using his reindeer as transportation for his sleigh? I thought that reindeer were means of getting there, not passengers. 3Tyrannosaurus Rex receives a bone for Christmas as he always wanted. I understand that dinosaurs are cool kid appeal animals, but still, they haven’t roamed the Earth in 65 million years. To have a dinosaur in Christmas regalia is about as anachronistic as The Flintstones Holiday Special. 4This snowman seems all dressed up and ready to get himself a buck. 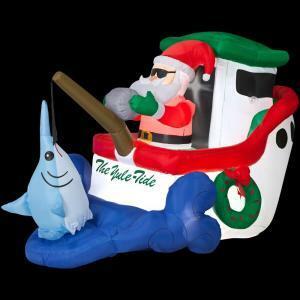 5For those who love Christmas and Ernest Hemingway, then this is a great inflatable decoration for you. When you take the Christmas stuff off of this decoration, you have yourselves an inflatable lawn decoration of Hemingway’s The Old Man and the Sea. 6Looks like Santa is climbing in the pool for a swim with a reindeer, penguins, and a polar bear. Knowing that Santa lives in the North Pole, then he must be a member of the Polar Bear Club. Still, what the hell are these penguins doing here? They live in Antarctica, not the North Pole for God’s sake. 7Merry Christmas from Santa’s trailer. Looks like Santa and Mrs. Claus might need to go to marriage counseling or aren’t on great terms right now. 8While most of Santa’s reindeer are guys who pull the sleigh, their mates stage their own roller derby night. Still, at least this decoration gets it right that female reindeer do have antlers during this time of year. And in many species, they are the only ones with antlers in December since the males have shed them since mating season. Still, I’d rather not recommend roller derby to anyone since it’s a very violent sport. 9Santa and his friends travel the world in their hippie van encouraging kids to be nice, not naughty. So if Santa Claus is an aging bohemian, does this mean that smoking pot, taking drugs, and engaging in free love won’t get you put on the naughty list? Also, does this mean that soldiers get coal this year? 10Man, it’s so cold outside that even a snowman is shivering in his igloo. Wait a minute, snowmen are made of snow and shouldn’t be shivering in the cold. If they get warm, they melt. Simple is that. So why is this snowman getting the chills? 11For the kids, celebrate Christmas with an inflatable lawn Noah’s Ark. As a practicing Catholic, I need to say that this inflatable decoration makes no theological sense whatsoever. I mean most Christians usually celebrate Christmas to honor the birth of Christ. Well, Noah’s Ark is recorded in Genesis so there’s no reason why it shouldn’t have any Christmas decorations on it. 12Looks like Frosty the Snowman and his penguin friend are enjoying a long vacation at the beach sipping coconut drinks. Seriously, what the hell is that snowman doing here next to a palm tree? Snowmen basically melt and evaporate in warmer, tropical climates. So there’s no reason why Frosty should be near a palm tree in the first place. 13Here’s Santa Claus relaxing in his palm tree hammock after making his Christmas Eve rounds. Now I don’t know about you but doesn’t it seem a bit odd that Santa is still in his red suit? I don’t mean to be rude, but if Santa doesn’t strip out of that big red winter suit anytime soon, he might as well be rushed to the hospital for heatstroke. That, or sweating like hell. 14Seems like the gingerbread man and his girlfriend have enjoyed a great time in the witch’s oven from Hansel and Gretel? Gingerbread people seem surprisingly nonchalant about being baked alive! Seriously, what kind of sick and twisted person think this would make a great Christmas decoration? It seems more likely to give kids nightmares. 15Merry Christmas from this Cowboy Penguin. Now cute as this decoration may be, we must understand that penguins usually live in the Southern Hemisphere with the northernmost ones residing in the Galapagos Islands. And I’m sure that cowboys have little-or-nothing to do with Christmas either. So a penguin cowboy Christmas decoration would more or less make better sense in Chile where it’s summer. 16Looks like it’s Casino Night at the North Pole. Sorry, kids, but none of you are getting presents this year because Santa’s got a gambling problem and needs to pay his loanshark bookies. 17Santa Claus enjoys his vacation with a penguin in a hula skirt? From the Huffington Post, “Surprisingly, global warming is welcomed by Santa and his… hula penguins.” Need I say more. Also, at least Santa has his shirt on. 18Santa’s ability to withstand chimney fires made him the perfect recruit for the fire department or something. Then again, there are a lot of firefighters out there who do look like Santa Claus. I mean a lot of firefighters I’ve seen do tend to be obese and may have white beards. 19My, my, so Grandma did get run over by a reindeer after all. Except that Santa wasn’t responsible. And when we mean “Grandma got run over by a reindeer” we mean she was run over by one operating a steam roller. Still, first vehicular manslaughter and now this? What’s Santa doing to these reindeer? 20Seems like Santa Claus is a badass biker dude on his motorcycle. Keep in mind that a motorcycle holds way fewer presents than a sleigh and the insurance is higher. Also, wasn’t there a Six Feet Under episode in which a mall Santa got hit by a truck while riding a motorcycle? The biker funeral episode is perhaps one of the best of the series but those kids will be in therapy for life. 21Man, it seems that these penguins are certainly getting along with the polar bear. Still, we have to acknowledge that penguins don’t live in the North Pole and even if they did, they’d certainly not get along with polar bears. In fact, the polar bear would certainly eat them. 22Seems like Santa has ditched the sleigh and replaced it with a chopper. Man, I’m not sure if I’m comfortable with the reindeer being out of work. Also, what’s Rudolph to do with his red nose now that he’s unemployed? 23Think of it as Christmas meets Stagecoach. So does this mean that Santa is taking these penguins back to the Southern Hemisphere where they belong? If not, then where? 24Ahoy, mateys, step right aboard on Santa’s pirate ship. Wait a minute, Santa gives presents to children, not take away cargo and other items from merchant ships! Then again, Saint Nicholas is the patron saint of sailors. Still, why does this even exist? 25Merry Christmas from the 9 foot mutant penguin spreading holiday cheer. Wait a minute, isn’t the idea of a 9ft tall penguin something from a nightmare? Still, why does this thing exist? 26Looks like this reindeer is hunting from a tree with a ladder. Since December is deer hunting season, it’s hard to tell whether this one is hunting for his own kind, trying to protect himself, or both. Either way, there’s something very wrong with this. 27Okay, so maybe Santa Claus can’t withstand all chimney fires. Santa should be lucky that Dasher was able to get a hold of the sleigh fire extinguisher and put out the flames in time. Sadly, Santa didn’t have a spare pair of pants and had to spend the rest of the night giving presents to kids with his rear end exposed. 28Just two reindeer roasting marshmallows at the campfire while Santa sleeps in his tent. Since how does Santa ever have time to go camping with his reindeer? Also, isn’t he supposed to be making toys this time of year? 29So to commemorate the holiday season, Spongebob Squarepants decided to through some disgusting mutilation to make himself look like a Christmas tree. Now this is bound to give Spongebob’s youngest fans nightmares. Yet, I hope he gets back into shape after the holidays. Still, he doesn’t seem remarkably disturbed by looking like a Christmas tree. 30Hello, and welcome to Santa’s Snack Shack. Well, if you want a new Xbox for Christmas, Santa has to pay for it somehow. Those presents don’t pay for themselves, kiddo. 31Seems like Santa really enjoys riding on his quad runner ATV. Seriously, those things are basically gas guzzing four wheeled motorcycles. Besides, I’m sure they’re not cheap either and make lots of unnecessary noise. Not to mention, Santa seems just way too cool for those. 32Fuel up, elves, because Santa needs to take a pit stop. Santa, this seems too dangerous for you! You don’t want to wreck on the racetrack don’t you? Still, why does this thing exist for God’s sake? 33During the summer, Santa and Rudolph take gigs as lifeguards on the beach. From Huffington Post: “We get that sometimes people have to take lifeguarding gigs in the summer, but SANTA? Really?” Still, I could understand Rudolph but I’m not sure if reindeer know how to swim. 34Looks like Frosty the snowman has opened up a new popcorn stand. So how does Frosty manage to scoop up the popcorn from the machine without melting his hand? I mean it takes a lot of heat to make popcorn pop doesn’t it? Perhaps Frosty should just stick to selling ice cream instead. 35Frosty the Snowman takes his penguin pal for a ride on his new ride. Uh, doesn’t it get hot when you turn on a motorcycle? I mean people wear leather jackets on them for a reason. Still, it’s a wonder Frosty is able to retain shape while riding one. 36Nothing says Christmas like your very own Christmas cactus. Wait a minute, cacti live in warm desert climates, not in places with snow. Also, they aren’t things you want to decorate because of their needles. Not to mention, I’m not sure if a cactus has anything to do with Christmas whatsoever. 37Behold, a neon dancing Santa Claus. Man, Santa seems to have lost a lot of weight since he started working out more at the North Pole gym. 38Since his sleigh is now in the shop on Christmas Eve, Santa now delivers presents on his new 8-wheeler trailer truck. Of course, there are plenty of truckers who look like Santa Claus so maybe Saint Nick is onto something here. Still, I bet the reindeer aren’t too happy being unemployed though. And I’m sure that truck is a gas guzzler for sure. 39Looks like the sleigh has run out of gas. Wait a minute doesn’t reindeer transport prevent the need for Santa to stop at a gas station? Also, even if the sleigh were powered, wouldn’t run on some kind of alternative fuel source like magic? 40Of course, Darth Vader knows what you’re getting for Christmas since he can feel your presents. Now I’m not sure Darth Vader would make an appropriate Christmas decoration mainly because he blew up his daughter’s planet and froze her boyfriend in carbonite before handing him over a bounty hunter, cut off his son’s hand, killed his mentor, and force choked his employees. Yeah, I’m sure this Star Wars villain is on the Dark Side of the Force and you wouldn’t want this man to be your father. Definitely not a character who fits the Christmas spirit. 41Looks like Santa had a little accident with his sleigh. Perhaps we should concede that Santa Claus probably isn’t the best driver as far as reindeer pulled sleighs are concerned. Still, I wonder if he has accidents every year or just once in a blue moon. 42Looks like a polar bear got his tongue stuck at the North Pole during the ugly sweater party. Of course, we should all know that the elf talked the polar bear into it. Guess he ain’t getting any presents this year. Still, I’m sure the bear isn’t going to be happy once Santa sorts things out. 43Since reindeer tend to be too much trouble, Santa decided to deliver presents via dump truck. I’m sure this doesn’t bode well with the quality of toys this year. Still, I think he should give the reindeer their jobs back before they go on strike for higher pay. 44Man, it’s so cold out, I swear the snowmen and penguins are shivering. I can understand the penguins since they might freeze to death during Antarctic winters. But the snowman? C’mon, it’s made out of snow. 45Merry Christmas from your local neighborhood Spiderman. Sorry, that Santa couldn’t go on his rounds this year. So you’ll have to make do with Spiderman. Sure he has no sleigh and reindeer, but he can swing house to house with his web. 46It’s great fun at the North Pole on Santa’s party barge. Let’s hope nobody drinks too much eggnog, especially Captain Santa. Then again, I might watch out for the polar bear, too. 47Some fish wants to give Santa a present. Now this absolutely makes no sense to me. I mean Santa was about to catch that fish wit intent to have it for dinner. But both seem quite cheerful for some reason. 48Merry Christmas from Spiderman as he scales up his wall. Uh, spidey, are you sure you’re going to do fine with that sack? Looks a bit heavy. Hope you don’t break your back. Also, you might want to give the job to Superman. Or Ironman.